We are currently looking for energetic Salespersons with a passion for protecting the U.S. Constitution and high-quality American craftmanship. 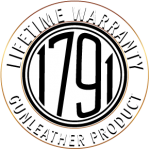 Here at 1791 Gunleather out mission is to make our high-quality leather Gun Holsters and accessories available to gun-owners across America. If you are looking to start a career with large earnings potential and growth opportunities we’d like to hear from you. Please fill out the application and attach your CV/Resume and a representative will reach out to you within 3 business days.